Creator: Simple Shoes – shoe geeks making a new shoe-topia! With all the over-built, over-hyped products out there, it’s pretty hard to ?nd sustainable shoes that you can live with. 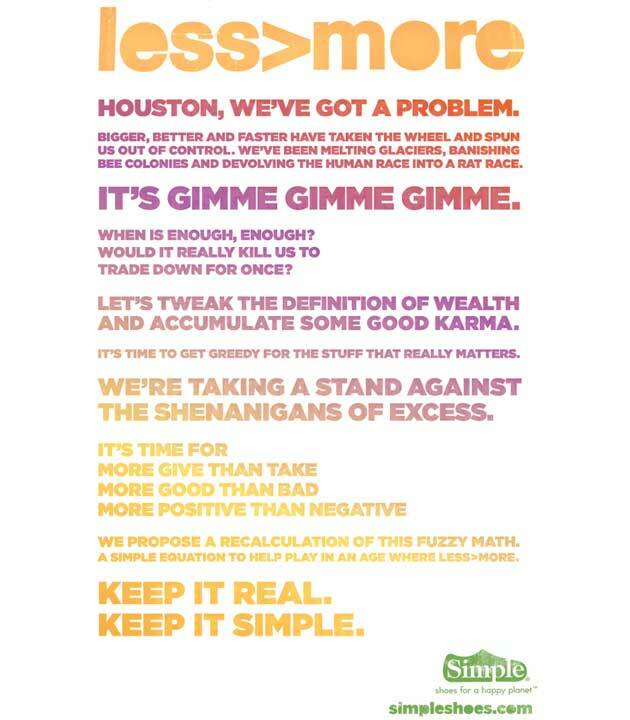 So we started Simple, your stereotypical, anti-stereotype brand offering good shoes and a big dose of reality. About a gazillion pairs later… give or take a few… we’ve managed to learn a few things. Well, actually a lot of things. And none more important than this: HOW we make our shoes is just as important as WHY we make them. That means finding more sustainable ways of doing business so we can make a gazillion more. Which pretty much is where we are today… at the crossroads of here and now, aware of our responsibility to the planet while trying to pay the bills. The nice little shoe company getting in touch with its inner hippie.